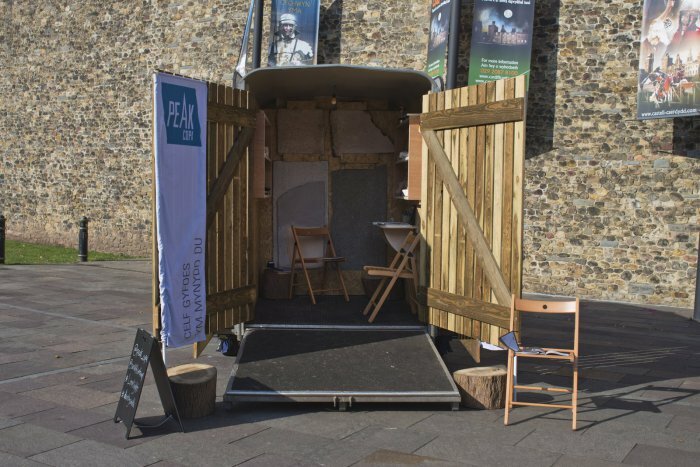 The Horsebox Studio Commission is a partnership project between Peak/Copa and the Abergavenny Food Festival. We are seeking a professional, Wales-based visual or applied artist of any discipline, to respond to the distinctive region of the Black Mountains and to the themes of the festival to produce new work in collaboration with the public, which will be created and presented in Peak’s Horsebox Studio on site during the festival weekend (16th and 17th September 2017). Themes: growing, cooking, agriculture, sustainability, food culture, the politics and economics of food production, individual and collective memories of food, markets, small holdings. The artist must be available during the preparation and delivery of the festival weekend (16th and 17th September). The artist is expected to spend a minimum of 8 days working on the research, preparation, delivery and evaluation of the commission (at least 4 days to be located in Abergavenny). The selected artist will be required to produce new work in collaboration with the public, however the format and outcome is not prescriptive and the artist will be supported by Peak staff to finalise their proposal during a research and development period at the beginning of August. In liaison with the artist, Peak will design engagement activity in response to the commission, including an artist talk, school/college visits and digital content throughout the period of the commission. Peak’s Horsebox Studio was purchased and adapted in 2016 with support from the Brecon Beacons Trust. The Horsebox Studio is a mobile, creative project space and has since welcomed over 1,300 visitors at Green Man festival, Cardiff Contemporary, Royal Welsh Show Spring Festival and Canal & River Trust Open Day, Llangattock. The Artist Commission is supported through Arts Council of Wales funding. The deadline for applications is 10am, Wednesday 19th July 2017. Peak/Copa is an initiative devised and delivered by Arts Alive Wales, an arts education charity based in Crickhowell, Powys. Peak creates opportunities for contemporary art in the Black Mountains and Welsh Borders for the benefit of the region’s artists, communities and visitors.